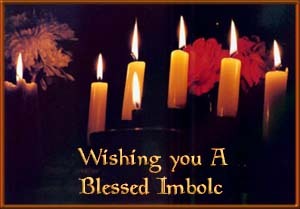 Imbolc is the Celtic holiday that marks the beginning of spring. as the "good god," had three daughters, who were all named Brigit. The first Brigit was the goddess of poetry, the second was the goddess of smithcraft, and the third was the goddess of fire and healing. All three are really aspects of one triple goddess who was associated with the Sun and with fire. On this day Brigit used her flame to rekindle the fire in the earth and assure that plants would have the heat that they need to break through the earth and begin to grow. In ancient times, a woman dressed as Brigit would bless the fires in the households and forges across Ireland. On this day, Brigit's snake would come out of its mound, and the snake's behavior would determine how long the remaining frost will last. This is the most likely origin of Groundhog Day. In Christian times, Brigit became a saint associated with the Virgin Mary. Imbolc became the Christian Candlemas, the Feast of the Purification of the Blessed Virgin Mary, which is celebrated by lighting candles. A Brigit's cross is a talisman made of woven reeds that form a cross with a woven square in the center and four equal arms extending out from the center. This design gives the cross a sense of rotation that evokes the wheel of the year. Brigit's cross should be made or bought on this day and used to protect the home throughout the year. Also on this night one can leave a silk ribbon on the doorstep for Brigit to bless. Later it can be used for healing.